Last night the Olympics started in full swing. I love the Olympics. I love everything they represent. I love that people put aside differences, come together and celebrate the games. Countries may not always get along but I always find it amazing that for 16 days everyone comes together. I've been watching the Olympics since I can remember. I first winter games I remember watching were in 1992 at Albertville, France. I've been hooked since. The opening ceremonies did not disappoint. I thought what they did with the led screened floor was amazing! The performers were great (even though Sarah Mclachan can't lip sing to save her life). Favorite songs, Joni Mitchell's I've looked at Love and of course Hallelujah. The minute of silence for the death of the Georgian athlete was so touching. I don't think there was a peep in that whole stadium. Now that the games have started, I can't wait for the ski jumping, bobsledding and figure skating to begin. My dvr is going to be getting a major workout. I watch everything...even the curling. A girl I work with Loves the olympics too!!! I must say because she watches it so much I really got into the summer olympics so I am sure the winter will be the same way. Hope you enjoy them. I am totally excited, too. I remember dreaming about it when I was a kid. Enjoy! Listen, I'm so with you. I LOVE the olympics so very much. There is just something about it that makes me so enthusiastic and I will seriously watch it 25/7. I like the aerial ski jumpers! It was a beautiful opening! Hey, I meant to ask you, what is the contact info for thet photog in Dayton that you know? I love to watch Apollo speed skate! So fun! The ceremonies were great and the death of the luger is almost unbearable. So sad. I like Summer Olympics better but I do love a great ice skating routine here or there!!! I LOVE the Olympics... I get goosebumps, I cry when they play the Star Spangled Banner and hand out awards... love every second. Favorite sport? I love figure skating... but I also love the skiing... and skating... pretty much love it all I guess! I LOVE the Olympics!! They make me so happy! 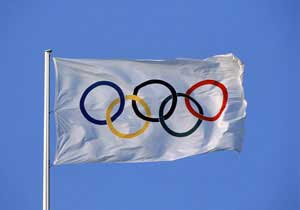 I'm not normally a sports person, but I get so excited for every sport when it's the Olympics! I too love the olympics and really enjoy watching all the different sports people live for! I am in Vancouver, and my kids (3, 5 and 7), husband and I are checking out as much of the in-town, no ticket required events as possible. It is pretty neat and we met an athlete (bobsled) from NYC at Granville Island the other day. I loved explaining to my girls when the freestyle skiers (and speedskaters, ice skaters, boarders ... ) fell and picked themselves up and kept going, how important that attitude is to champions. And people in general. I love the Olympics too! The ice skating is awesome!